Trust Preservation offer a comprehensive dry rot treatment service from survey through to full remedial treatment. As with all of our services, the first step will be to complete a thorough inspection of your property so that our experienced staff can determine the extent of the problem and most effective course of treatment. 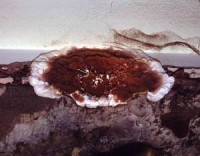 To fully assess the dry rot and its causes, our survey may well require the removal of some skirting, panelling or plaster. We will discuss our recommendations for treatment and provide a quotation for the work. 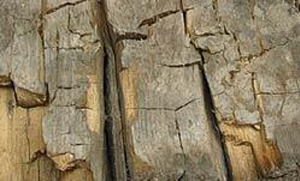 Fungal decay occurs because wood has become wet and usually timbers will be in excess of 20 per cent moisture content. Finding the source of dampness, eliminating the ingress of moisture and promoting drying is integral to a long lasting solution. Wood loses weight as the result of the breakdown of the cellulose and the removal of the breakdown products (sugars) by the fungus. White fluffy cotton wool like mycelium may appear under still, humid conditions. A silky grey coloured skin frequently tinged with lilac and yellow patches will develop under dryer environmental conditions. Stands develop in the mycelium these are brittle when dry and crack on bending. Fruiting bodies are a soft and fleshy pancake or bracket with an orange/ochre surface; the surface has a reticulated or wide pore finish. Red rust spores frequently visible around fruiting bodies. 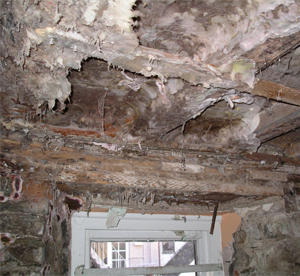 Active decay produces a musty damp odour.